LONG ISLAND CITY — A year after Hurricane Sandy, a home in Queens is getting a massive green makeover — including raising all three floors above flood level — in order to protect it from future storms and serve as a model for other homeowners. The three-story home at 45-12 11th St. in Long Island City, dubbed the Climate Change Row House, will incorporate a number of sustainable features to serve as an example of how similar city homes can help combat rising energy costs and potential damage from extreme weather events, according to contractor Mike Miceli. Miceli, president of All Dimension Construction, is spearheading the project for owner Thomas Paino, an architect who owns the home. Though the house wasn't flooded by Sandy last year, it's located just a few blocks from the waterfront, in Flood Zone B. In order to protect against future flooding, all three floors of the structure were raised about 3-1/2 feet, so that the lowest level is now a foot above the flood level. "The most important thing to do is to make sure that the living areas you're going to be building are not in the flood zone, that they're above harm's way," Miceli said. 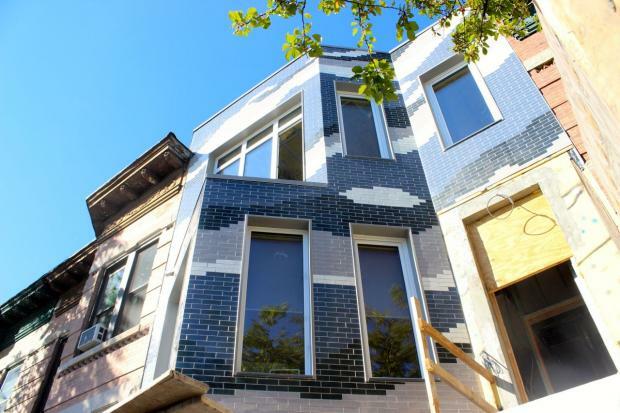 In addition to elevating the house, the Climate Change Row House is applying Passive House building techniques — a type of design that originated in Germany which emphasizes energy efficiency. The home is being outfitted with twice the amount of insulation of what's used in a typical house, and will have triple-paned windows and sealing to prevent air from leaking in or out. "It's just a super-insulated, air tight shell, that if built properly, will save you anywhere between 75 and 90 percent on utility costs," Miceli said, explaining that the extra insulation helps regulate the temperature inside the building. If it's 100 degrees outside, for example, it might be 70 degrees inside the house. If it's 30 degrees in the winter, the temperature inside a Passive Home will likely be the 50s. "This just basically keeps the thermostat at a more level rate at all times, so your mechanical system is just working less," Miceli said. Passive Homes are still uncommon in New York City, Miceli said, namely because people assume they're too expensive. While that can be true, many of the design features can also be done affordably, he said. "Things like insulation and things like air sealing the building don’t really cost that much when you look at the collective whole of the project," he said, adding that green designs used in a project like the Climate Change Row House might tack on an additional 10 percent to the entire costs. And the sustainable features can help homeowners save money over the long term, he argues. "With climate change, and with energy costs rising, the need to keep your operating costs on your building as low as possible is important," he said. "If you look at what it costs to heat and cool a house say 30 years ago it was probably one-tenth of what it costs today. That cost is only going to rise."